Bay Area locals are sure to have had experienced amazing sole dishes from classic restaurants like Sam's or Tadich Grill where this fish is a staple on their menu. Petrale sole are caught using the same gear as the Rockfish from the F/V Miss Moriah out of Half Moon Bay, California. While most fish are typically shaped like a bullet to help them propel through the water Petrale sole are a type of “flatfish” - a fish that has eyes on top of its head and a flat body that is designed to allow the fish to glide along the ocean floor while still being able to see any food or predators lurking above them. We have a few different names for flatfish - generally speaking left-side up flat fish are called flukes and right-side up flat fish are called flounders (there are some exceptions to the east coast flat fish). This grouping includes sole, flounder, plaice and halibut. The term "sole" refers specifically to fish in the family Soleidae in the order Pleuronectiformes. It represents 30 genera and 130 families of fish. The term "flounder" refers to fish in the families Achiropsettidae, Pleuronectidae, Paralichthyidae and Bothidae. Which means technically a Petrale “sole” is really a right eyed flounder because it is in the family Pleuronectidae in the order Pleuronectiformes! This is why we usually just refer to them as “Petrale” and why we are such big advocates for properly labeling fish! It can be really confusing - even for us! What makes a flounder flat you ask? It is a special adaptation that they have developed over many generations of evolution to help protect them from predation! Flatfish actually start out their lives looking like any other young fry (a baby fish) however as they grow their bodies begin to flatten and their eyes move from being on either side to both being on the top of the fish - with one eye being the dominate side. They even have developed special coloring to help them blend into the ocean floor - that is why flat fish are always sandy colored and speckled to mimic the specific substrate they live in. Their bellies are usually white - this helps them when they swim up in the water column so when you look up at them from above they blend in with any glimmering light that might be seen from the surface. This awesome video from National Geographic demonstrates a new study surrounding how flatfish move across the ocean floor! The dish that made Julia Child fall in love with French cooking - Sole Meunière is a simple, quick and utterly delicious way to enjoy our local Petrale! 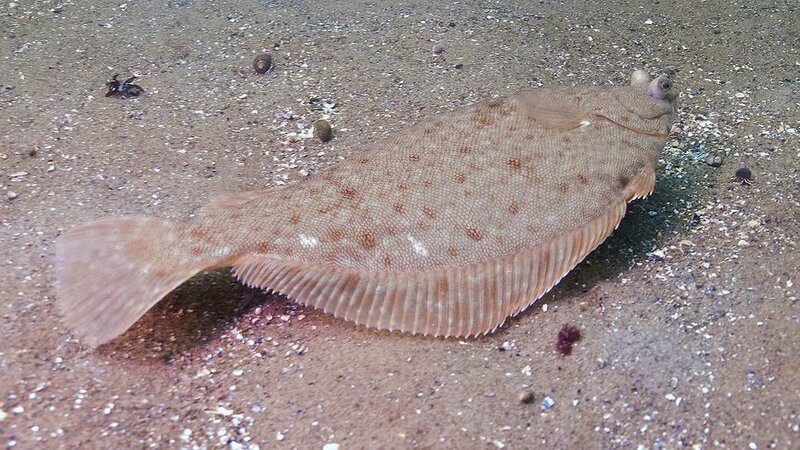 Petrale sole is a right-eyed flounder found along ocean bottom off the Pacific coast. They range from Baja California up to Alaska and can be found at depths as far down as 1,370 feet, but are most commonly found between 330 and 500 feet deep. It is an important commercial fishery locally, and has been fished off Oregon coast commercially since 1884. Although Petrale have a range from Baja up to Alaska there is only one fishery that currently exists between California and British Columbia. Petrale have two rows of little sharp teeth and they like to feed on shrimps, crabs, hake, herring, anchovies, and other flatfish. They can be found in large schools and spawn from October to April, a large female can produce anywhere between 400,000 and 1.5 million eggs each about 0.05 inches in diameter. They can reach sizes of up to two feet and are not sexually mature until between the ages of three and eight years. They can live up to 35 years. They are know for having a wonderfully sweet, delicate nutty flavor and thin fillets that are best cooked by simply sautéing with lots of butter and herbs! The immune system of the body needs all the help it can get, given the barrage of pathogens and possible illnesses attacking it every day. Selenium has been directly linked to stimulating immune system activity, and also acts as an antioxidant to protect the body from chronic diseases. Antioxidants can seek out and neutralize free radicals that can cause cellular mutation. A 3-ounce serving of cooked Petrale contains 27.7 micrograms of selenium, or approximately 50 percent of the recommended daily allowance. Selenium promotes the health of the immune and endocrine systems and acts as an antioxidant by inhibiting the ability of free radicals to damage cellular tissue and DNA. A diet that includes plenty of selenium-rich foods like Petrale may help prevent rheumatoid arthritis, cancer, heart disease and recurrent infections. Petrale is considered a low-energy dense food - because it has very little calories or fat per gram (including saturated fat). Including more low-energy dense foods in your diet helps you feel full on fewer calories, which might make it easier for you to manage your weight! Additionally, Petrale contains all of the essential amino acids, making it a high-quality source of protein. Every cell in your body contains protein, which makes it essential for maintaining and repairing tissue, organs and muscles. Petrale is a great source of vitamin B12! Vitamin B12 enables your body to produce healthy red blood cells. The vitamin also supports normal brain function. Getting sufficient amounts of vitamin B12 can reduce your risk of cardiovascular disease, according to the National Institutes of Health. A single serving of Petrale contains 20% of our daily Vitamin D intake and 40% of our daily phosphorous requirement. Vitamin D is necessary for the growth, development and maintenance of bones. It also plays a role in regulating cell differentiation, blood pressure and immune system activity. If your diet lacks adequate vitamin D or phosphorous, you may be more likely to develop high blood pressure, cancer, heart disease, obesity, osteoporosis and multiple sclerosis. If you are at high risk for osteoporosis or are getting older and want to guarantee an active lifestyle in the future, foods like Petrale are very important. Fish like Petrale are actually a better source of phosphorus than beans, whole grains and nuts because the phosphorus found in plant-based foods is in the form of phytate, which is not easily absorbed by the body. Petrale is a good source of Magnesium - a mineral that helps in energy production, and is also needed to make protein and aid in blood sugar and blood pressure control. How is it caught and what does Seafood Watch say? All of our Petrale sole is caught by the California Groundfish Collective (CGC) with bottom trawls is considered a "Best Choice” by Seafood Watch. Capt. Geoff Bettencourt and the F/V Miss Moriah are one of a very select handful of boats that are a part of the California Groundfish Collective. This means that their every move is recorded by multiple cameras set up by the Nature Conservancy to ensure sustainability and have a way to validate their accountability at sea. Habitat protection measures like closed areas or gear modifications reduce seafloor impacts, and more policies are being developed to protect the ecosystem. For the most part the fish that we are getting are between 2 to 10 years in age. Our boats try to target mature populations that have already had the opportunity to breed.